The Assumption is the belief that Mary, at the conclusion of her earthly life, was taken body and soul to heaven. It is implied in various passages of Scripture, probably most vividly in Revelation 12, and was believed by the early Christians, as indicated by the ancient liturgies and writings. 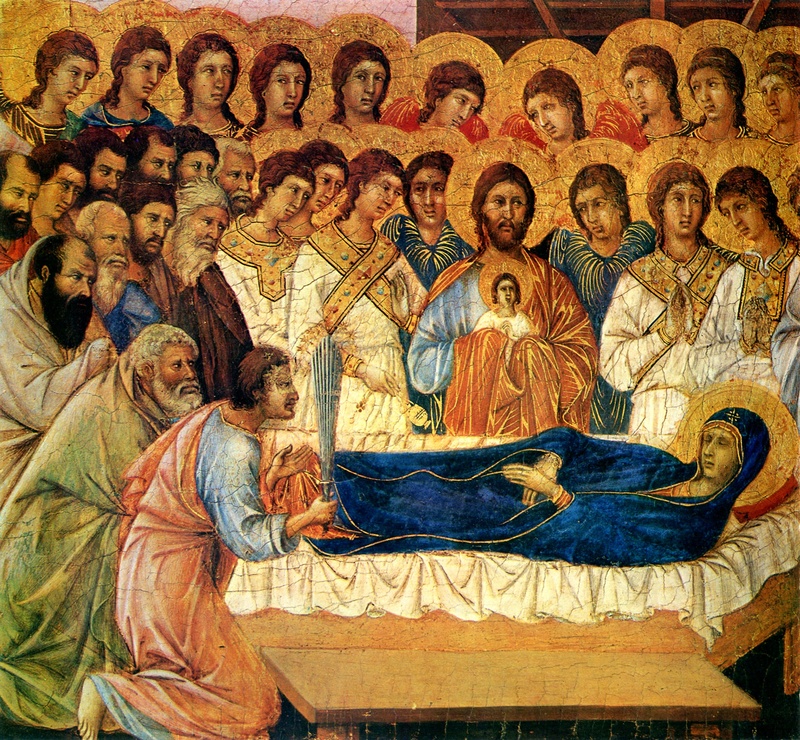 Perhaps the greatest historical proof of the Assumption, though, is the fact that no individual or community has ever claimed to possess Mary’s body.1 One can be certain that had the body of Mary, by far the most exalted of the Saints, remained on earth, the followers of Christ would have been well aware of it. There happen to be two different beliefs concerning the place of Mary’s passing: one pointing to Jerusalem; the other to Ephesus. Of the two, the former tradition is older and better substantiated. Interestingly enough, an empty, first-century tomb was discovered during excavations at the site of her passing in Jerusalem in 1972 (see Bellarmino Bagatti, Michael Piccirillo, and Albert Prodomo, O.F.M., New Discoveries at the Tomb of the Virgin Mary in Gethsemane, Jerusalem: Franciscan Printing Press, 1975). Some scholars have doubted the authenticity of this tomb since it was not referred to by the early Fathers who lived in Palestine, such as Cyril of Jerusalem (d. 386), Epiphanius (d. 403), and Jerome (d. 420). But, as archeologist Bellarmino Bagatti pointed out, Mary’s tomb was generally avoided by early Christians of Gentile origin because it stood on the property of Judeo-Christians, who “were considered schismatics if not heretics” (ibid., p. 15). For the same reason, other holy sites, such as the Upper Room, do not appear in early writings either (ibid.). It should be remembered as well that the forces of the Roman General Titus obliterated Jerusalem in the year 70, concealing places sacred to Judaism and Christianity beneath the rubble. In 135, the Emperor Hadrian leveled the city again with the express purpose of constructing pagan temples atop the ruins of holy sites. The spot of Mary’s passing and other sacred places remained lost until the fourth century at least when the Emperor Constantine the Great gradually began to restore Christianity’s hallowed sites, starting with the Holy Sepulchre in 336.] The Assumption provides an example of a disciple of Christ following after Him in a bodily resurrection, pointing to the reality for which all Christians hope. Ultimately, it attests not to her holiness, moreover, but to the holiness of Jesus, on whose account she received special prerogatives. While it has always been believed by Christians, the Assumption was officially declared a dogma of the Catholic Church by Pope Pius XII in 1950. Certainly one can see God’s loving wisdom in affirming Mary’s bodily resurrection to the world at the midpoint of a century that witnessed so many grave injustices against the dignity of the human person. At the time of the dogma’s proclamation, the world was emerging from the horrors of the Nazi death camps and swiftly approaching the state-protected killing of the unborn child. The nobility of woman and her chief vocation of motherhood have especially been assaulted by modern society, which has focused inordinately upon her exterior beauty and sought ever to reduce her to an object of lust. In stark contrast to these proclamations of the culture of death, Mary’s Assumption declares the dignity of womanhood and of the human body, of the human person, in a powerful way. The dogma of the Assumption rests upon the Church’s authority to feed Christ’s sheep (cf. John 21:15-17; Luke 10:16) and Our Savior’s promise that His Church shall teach the truth (cf. John 14:26; 16:13; Matt. 16:18-19; 1 Tim. 3:15). This infallible authority has always been trusted to divine the true teaching when disputes have risen among the faithful. We see this in the calling of the Council of Jerusalem (Acts 15); in Paul’s seeking of the Apostles’ approval of his preaching many years after his conversion (Gal. 2:1-2); and in the actions of the latter Ecumenical Councils, which proclaimed the divinity of Christ in 325, the divinity of the Holy Spirit in 381, and Mary’s divine maternity in 431. Theologically, the Assumption is closely related to the Immaculate Conception, which states that Mary, by a special grace from God, was spared from the stain of original sin from the first moment of her existence. Her freedom from sin is implicit in God’s promise upon the Fall of Man to place enmity between the devil and the Mother of the Redeemer (Gen. 3:15). Going back to apostolic times, the Church has revered Mary as the New Eve, faithful helpmate of the New Adam. Just as the first Eve believed the lies of Satan, a fallen angel, and by rejecting God’s plan brought sin and death into the world; so the New Eve believed the truths of Gabriel, an Archangel, and by cooperating with God’s plan brought salvation and life into the world. In contemplating Mary as the New Eve, moreover, we come to realize that in orchestrating our redemption, God in a surprisingly literal way reversed the events of our fall. Originally, for example, Adam came first; and Eve was formed from his flesh. In the redemption, Mary, the New Eve, came first; and Christ, the New Adam, was formed from her flesh. Coincidentally, this is why in the New Covenant the woman and man were mother and son, not spouses as Adam and Eve had been. Or she continued to live. For, to God, it is not impossible to do whatever he wills; on the other hand, no one knows exactly what her end was (ibid. 78:11, 23). That Epiphanius did not know the details of Mary’s passing is perfectly understandable–Christians still do not know the details of it and it is likely the Apostles themselves did not know either, for her body was taken from within an enclosed tomb.9 Unlike other early writers, however, Epiphanius avoided inventing the details for himself. Though he did not know exactly what had taken place, he knew, in light of Mary’s perfect sanctity, that her passing had to have been miraculous–something that would “strike the mind of man with excessive wonder”–and that she could not have remained in the grave. “In the Apocalypse of John,” he also noted, “we read that the dragon hurled himself at the woman who had given birth to a male child; but the wings of an eagle were given to the woman, and she flew into the desert, where the dragon could not reach her. This could have happened in Mary’s case (Rev. 12:13-14)” (ibid. 78:11). 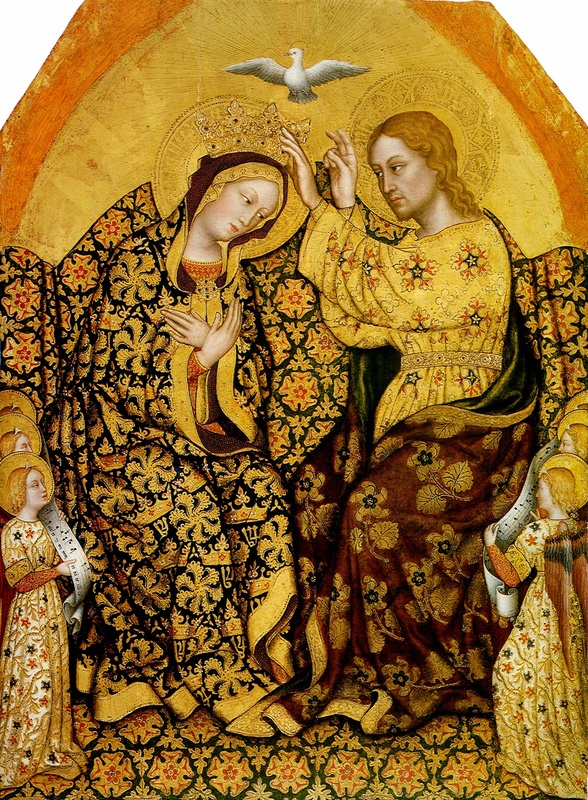 At the start of the fifth century, or earlier, the feast of the Commemoration of Mary–that is, the commemoration of her passing–was introduced into the Eastern Liturgy, placing it among the oldest of the Church’s official feast days.10 Around the year 400, Chrysippus of Jerusalem commented on Psalm 132, “The truly royal Ark, the most precious Ark, was the ever-Virgin Theotokos; the Ark which received the treasure of all sanctification” (On Psalm 131(132)). An orthodox writer from this same time period, operating under the nom de plume of Saint Melito of Sardis, a near-contemporary of Leucius, reproached him for having “corrupted the most ancient text by expounding his personal ideas which do not agree with the teaching of the Apostles” (Bagatti, et al., p. 11). This author endeavored to restore the true account of the Assumption, which he alleged Leucius had “corrupted with an evil pen” (The Passing of the Holy Virgin, Prologue). In about 437, Saint Quodvultdeus identified the Woman in Revelation 12 as the Blessed Virgin, noting, “Let none of you ignore (the fact) that the dragon (in the Apocalypse of the apostle John) is the devil; know that the virgin signifies Mary, the chaste one, who gave birth to our chaste head” (Third Homily 3:5). In about the middle of the fifth century, Saint Hesychius of Jerusalem wrote, “The Ark of thy sanctification, the Virgin theotokos surely. If thou art the pearl then she must be the Ark” (Homily on Holy Mary, Mother of God). Around 530, Oecumenius said of Revelation 12, “Rightly does the vision show her in heaven and not upon the earth, as pure in soul and body” (Commentary on the Apocalpyse). Writing of the Assumption near the end of the sixth century, Saint Gregory of Tours (unlike Epiphanius) did not avoid the incidental details of the Transitus story. “And behold,” wrote Gregory, “again the Lord stood by (the Apostles); the holy body (of Mary) having been received, He commanded that it be taken in a cloud into paradise” (Eight Books of Miracles 1:4). Critics of the Church’s Marian teachings have made much of the fact that the earliest-known accounts of the Assumption are found in apocryphal writings, and that the Church Fathers did not speak of it before the late-fourth century. It is also true, however, that the Fathers did not look to correct belief in the Assumption; they simply remained silent on the matter–an unprecedented stance if it was a heretical teaching, especially given its prevalence among the faithful. 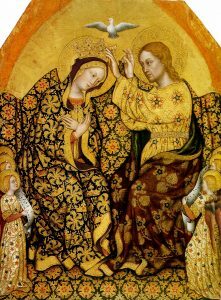 It is unlikely, indeed, that the concept of Mary’s Assumption, which upholds the sanctity of the human body, could have originated among the Gnostics, given that they denounced the body and all things physical. The Apocrypha, in fact, were often not the work of heretics, but of orthodox Christians seeking to impose details upon real events from the lives of Christ and the Saints that were otherwise shrouded in mystery. While apocryphists embellished the story of the Assumption, they did not invent it. 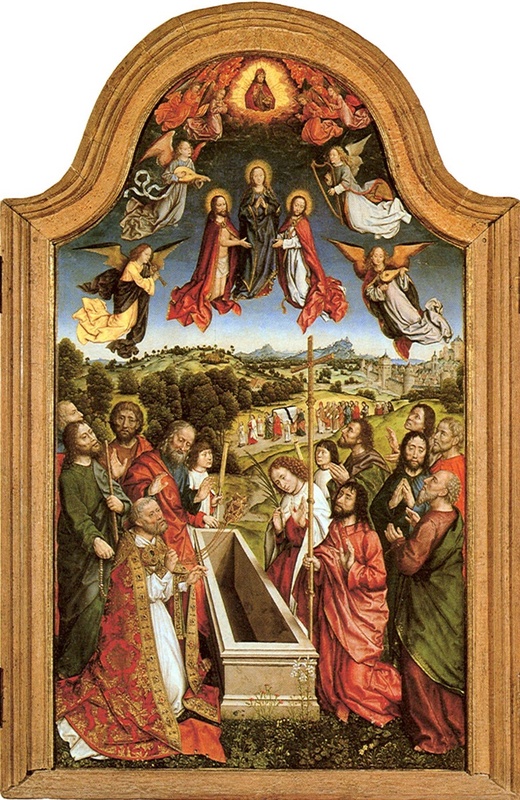 The fact that the Transitus existed virtually everywhere in the Christian world, appearing in multiple languages, including Hebrew, Greek, Latin, Coptic, Syriac, Ethiopic, and Arabic, proves the story of Mary’s Assumption was spread universally in the early centuries and, therefore, of apostolic origin. We are not unaware that many of these secret writings were produced by men, famous for their iniquity. … We must therefore use caution in accepting all these secret writings that circulate under the name of saints … because some of them were written to destroy the truth of our Scripture and to impose a false teaching. On the other hand, we should not totally reject writings that might be useful in shedding light on the Scripture. It is a sign of a great man to hear and carry out the advice of Scripture: “Test everything; retain what is good” (1 Thess. 5:21) (Commentaries on Matthew 28). In 494, Pope Saint Gelasius, seeking to guard the faithful against the potentially corruptive influence of the numerous religious writings of questionable authorship that plagued the Christian world, reissued the list of canonical books drawn up by his predecessor, Pope Saint Damasus, coupled with a lengthy catalog of acceptable and unacceptable extra-biblical books. Opponents of the Church have made an issue of the fact that an apocryphal writing on the Assumption is included among the forbidden books in Gelasius’ decre, but the Pope condemned an apocryphal account of the Assumption, of course, and not the Assumption itself. Apocryphal accounts of other orthodox beliefs are likewise condemned in the decree–the Protoevangelium of James, for instance, deals with the Nativity; and the Acts of Peter deals with Peter’s missionary activity and martyrdom in Rome. Even more to the point, the writings of Tertullian are banned, though his writings, for instance, simply entitled Baptism and Repentance, defend the orthodox position on these subjects. Does Gelasius’ condemnation of these books amount to the rejection of Baptism and repentance, then, or does it have to do more with a question of Tertullian’s character? For those seeking to find in the Gelasian Decree some compromise of Papal Infallibility, it should be explained that the banning of a book has nothing to do with the Pope’s infallibility since it is merely a disciplinary action, not connected with the defining of dogma. By nature, a disciplinary action is subject to change. It stands in place only so long as the perceived threat exists; once the threat has passed, the censure is lifted. In this particular case, as the canon of the Bible grew in acceptance the threat posed by the Apocrypha waned and the ban became obsolete. Protestantism tends to see this Woman as either a symbolic figure of Israel or the Church (cf. Gen. 37:9). Catholicism accepts these interpretations, but extends them to include in a specific way Mary, the embodiment of the people of God. Israel bore Christ figuratively; Mary bore Him literally. In commenting on this passage, Saint Quodvultdeus (d. 453), the Bishop of Carthage and a disciple of Saint Augustine, wrote that Mary “also embodied in herself a figure of the holy church: namely, how while bearing a son, she remained a virgin, so that the church throughout time bears her members, yet she does not lose her virginity” (Third Homily on the Creed 3:6; see also Clement of Alexandria, Instructor of the Children 1:6:42:1). The motif of God’s people escaping “on the wings of an eagle” to a place of refuge can be found throughout the Old Testament (see Ex. 19:4; Ps. 54 (55):6-7; Isa. 40:31, et al.). God’s promise of “escape into the wilderness” is profoundly fulfilled in the Assumption, Mary being the preeminent representative of His people. The symbolic references in Revelation 12 to a duration of time, “one thousand two hundred and sixty days” and “for a time, and times, and half a time” (6, 14), may represent the period of persecution, which the Church will endure, prior to the Second Coming of Christ.